Aura Cacia 100% Pure Baobab Oil is sustainably sourced from the nuts of the wild-growing African baobab tree. 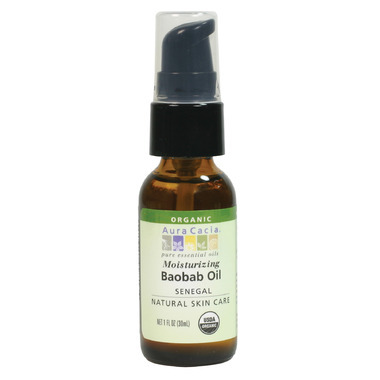 Baobab is a highly esteemed tree valued for its nutritious, skin-protecting oil which has a rich, slippery texture. A good oil for luxurious massage or for intense treatment of dry skin, baobab will leave your skin glowing and shielded from the elements. Directions: Use as body or skin care oil, a nourishing hair and scalp massage or to soften and moisturize dry skin. Enjoy the benefits of Aura Cacia essential oils by adding 1-2 drops of essential oil to each pump of baobab in the palm of your hand. Store in a cool, dry place. I had bought a natural eye serum that had this oil in it which I loved but I didn't want to continue buying the product as it was expensive. I saw this and thought I would give it a try and its been just as great at half the price. I want to try it for its other uses next. I love the product - it's very moisturizing and helped relieving dry spots I have been experiencing with the colder weather. The pump is really convenient. A wonderful product. I use every night as a moisturizer around my eyes. I enjoy using it. I used this oil sometimes in my scalp alternate with other oil from other brand, it moisturizes and soften my scalp, sometimes I used this in my face if there is a need to moisturizes it more in the night time.